Vertical rectangle. 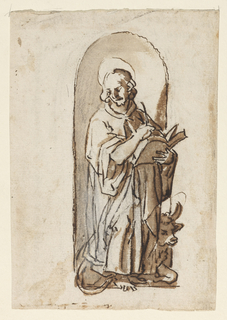 The Apostle stands before a niche, thinking about what he will write next. The Bull crouches behind him. The left lower part of the coat shows the correction of a first design. 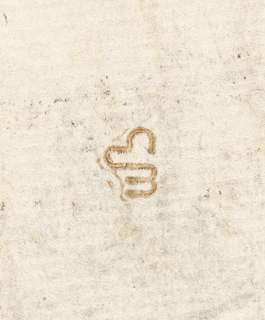 Verso: "B," horizontally. The bull runs towards left. The putto flies beside him, holding his head. 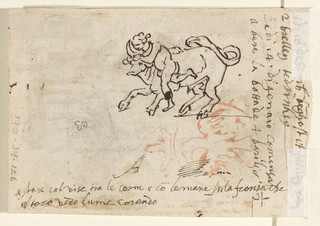 Caption: "A and scribbling/ a fare col vise fra le corne e con lemane sula fronte che/ il toro vede lume corendo." Notes vertically, on top: "adi 18 dicembre bighest et fatken van/ 2 trellen tetrinken/ La di 14 di gennaio comencai a/ bere la bottade 4 borili e 1/2."